The trickiest part of vacations is the weather. You can check the forecast over and over again, but you just never really know what Mother Nature’s going to give you. Well, we’ve found some places that stay in the mid-80s year-round. Sound good? Like water rides? Then browse our Top 10 U.S. Waterpark Resorts, find your match and plan your vacation whichever weekend fits your schedule! If any destination is synonymous with water-based fun, it has to be the Wisconsin Dells. And while the Dells themselves are just three miles away, Chula Vista Resort offers a waterpark that will make you never want to leave! Just try and picture the 200,000 square foot water park that has every kind of slide, and pool imaginable! There are many highlights of the waterpark, but first and foremost has to be the watercoaster. It's the longest in the world and you'll never get tired of it! But, you're looking for something a little less harrowing and a little more relaxing, the lazy river could provide hours of blissful floating! There's also a kiddie are for the little ones. Plus, depending on the season, there's an outdoor section of the waterpark as well. It features everything from a 30 foot drop slide to cabanas, to waterfalls! There's no better way to visit the Wisconsin Dells. At Chula Vista, you're just three miles away from the famous Dells which overlook the Wisconsin River. They're the perfect spot for a scenic day trip! If you want a break from the 200,000 square foot waterpark, then you should make sure to check out the 18 hole Golf Course which is also onsite at Chula Vista Resort! The numbers 41,000 and 150,000 may not mean a lot to the casual observer, but at Hope Lake Lodge & Indoor Waterpark, these two numbers play an important role in the fun you'll have in the water. This 41,000-square foot state-of-the-art indoor waterpark contains more than 150,000 gallons of water, and offers a fun-filled New York getaway for your entire family. Your family will love the wide variety of aquatic amenities featured at Hope Lake Lodge including a Wave Pool with two types of waves, body slides, an Activity Tower with a 500-gallon deluge bucket, three-story tube slides, a toddler activity pool, and so much more. Regardless of the weather outdoors, you can make a splash with perfect 84-degree year round weather at Cascades Indoor Waterpark. After a day full of fun in the water, retire to your comfortable lodge room or suite accommodations featuring flat-screen televisions, DVD players, fireplaces, and full kitchens/kitchenettes. You're in for an incredible family vacation with your next trip to Hope Lake Lodge & Indoor Waterpark. During the winter months, Greek Peak Mountain Resort is the ideal spot to plan your next downhill skiing or snowboarding getaway. During your summer getaway, Hope Lake Lodge offers a nine-hold disc course onsite for guests! While the kids are enjoying a day at the waterpark, the adults in your group can relax with a full menu of treatments at Waterfalls Spa at Hope Lake Lodge. The spa uses the principals of Feng Shui to ensure harmony, balance and a positive energy throughout your experience. With more than 40,000 square feet of water fun, Yogi Bear's Jellystone Park™ Camp-Resort in Gardiner offers one of the top outdoor waterpark experiences in the northeast! Located in Gardiner, New York, Yogi Bear's Jellystone Park™ Camp-Resort offers a waterpark getaway away from the hustle-and-bustle of the big city. The resort recently opened the Interactive Splash Pad, between their existing outdoor swimming pools, featuring two 100' waterslides, a 750-gallon hydrostream, kiddie slides, water cannons, and more! All of these combine to form Yogi Bear's Water Zone, a great place to plan your next New York family getaway. When it comes to accommodations, Yogi Bear's Jellystone Park™ Camp-Resort offers a wide variety of options, catering to your travel needs. Choose from cabins, RV sites, and tent camping sites, all of which allow you to experience the natural beauty of this area. Cabins can sleep anywhere from four to 16 people, and feature numerous amenities including a private deck area, charcoal grill, television with DVD player, fire ring, and kitchenettes. Find the unit that fits your family the best, or bring your own accommodations in the form of your RV. Golf cart rentals are available for rent at Yogi Bear's Jellystone Park™ Camp-Resort in Gardiner, and offer an easy way to navigate the property during your stay. Kayak rentals are also available for those travelers who wish to enjoy some time on the water. In addition to Yogi Bear's Water Zone, Yogi Bear's Jellystone Park™ Camp-Resort in Gardiner offers outdoor laser tag, mini golf, an outdoor playground area, gaga ball pit, and even an outdoor movie theater in a covered pavilion. The Grove Resort & Spa is Orlando’s ultimate vacation destination. Part of what makes The Grove so great is their expansive on-site waterpark. While your family stays at The Grove, make sure to spend plenty of time at Surfari Water Park. The park features a FlowRider Double surf simulator, dual water slides, a 695-foot lazy river, a zero-entry pool, and more. Take a break from waterslides and swimming to grab some food and a drink at The Longboard Bar & Grill. Those who want more privacy can rent one of their private cabanas for the day. At the Grove, guests can choose from a one bedroom suite, a two bedroom suite, or a three bedroom suite. The three bedroom suite helps you feel right at home by featuring a fully-equipped kitchen, full-size washer and dryer, and more. Enjoy the Grove’s spacious, residential-style suites and top-notch waterpark while also being only minutes from Disney World. If you still feel like something’s missing as you float along the water in a climate-controlled indoor waterpark, perhaps our next pick can color in the missing element – the sun! At the Great Wolf Lodge in the Wisconsin Dells, you can choose from indoor and outdoor waterpark fun. Work on your tan at Thunder Bay, Great Wolf’s outdoor component to their indoor waterpark, including an activity pool with water basketball, children’s play area and sundeck. Then take the excitement indoors for the same pleasant temperature with no UV rays. Indulge in all everything that makes Great Wolf Lodge in the Dells such a standout: MagiQuest, a 4-story live-action adventure game the kids will love; the winding lazy river of Crooked Creek; Mountain Edge Raceway, the nation’s first indoor competitive mat racer waterslides! And make sure to check out the Howlin’ Tornado, a heart-pumping 6-story tube ride that propels you through a giant funnel! To top off your family vacation, stay in the lodge’s themed Wolf Den Suite or KidCabin suite, giving the kids their own little log cabin or caved area. Ask about Great Wolf Lodge’s great summer rates! Great Wolf Lodge in the WI Dells features the Elements Spa for grown-ups, plus one for the kids: Scoops Kids Spa! From Chicago – Take I-90 towards Rockford and WI. Continue on I-90/94 W to Exit 92 (Hwy 12) to Gasser Road. Take a left on Great Wolf Drive. Great Wolf is straight ahead. Located in upstate New York, our No. 8 pick offers 38,000 sq. ft. of indoor waterpark excitement, perfect for all ages. Holding a steady 82 degrees year-round, Six Flags Great Escape Lodge and Indoor Waterpark is aptly named – it’s a great escape to the north for a vacation that feels far south! Right as you enter the waterpark, the kids will want to explore the Tall Timbers Treehouse, a multi-level play structure with waterslides and 160 interactive water activities! The Boogie Bear Surf replicates an ocean wave, giving guests the opportunity for body boarding and surfing – you can even take group surf lessons with an experienced instructor! Take a leisurely spin around the Tak-it-eesi-Creek, an adventure river that has sporadic water sprays. And make sure to try out the Avalanche family raft ride, a four-person tube ride that takes you through a 41-ft. drop to simulate a white water rafting adventure. The adults-only Soakum Springs, several tube-shaped waterslides and a shallow activity pool specifically for tots and young children round out your Six Flags Great Escape experience. 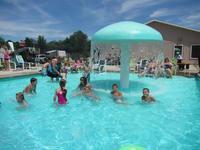 Ask about the lodge’s waterpark packages! Make sure to stop by the onsite Johnny Rockets restaurant, featuring juicy hamburgers, tabletop jukeboxes and a dancing wait staff! From NYC, take I-87N (NYS Thruway) to Exit 24 (to Albany). Continue north on I-87 to Exit 20. Go south on Route 9 for approximately ¼ mile and turn right onto Six Flags Drive. Though being along the beautiful Myrtle Beach and Atlantic coastline, our No. 4 pick gives you plenty of reasons to stay off the sand. Kingston Plantation Resort gives you 50,000 sq. ft. of outdoor oceanfront waterpark. When you’re competing with one of the most popular beaches in the U.S., you better have something under your sleeve. And Kingston Plantation Resort does – Splash! Waterpark. The kids will love this Caribbean-style water playground, featuring waterslides, water spouts, arch jet sprays and a giant bucket of water that dumps 500 gallons of water! While the kids are playing, relax near one of the two pools, partaking in a delectable poolside menu with tropical drinks. Relax in one of the three Jacuzzis, while indulging in the spectacular ocean views. A lazy river and poolside kids activities complete this exciting outdoor waterpark. Kingston Plantation Resort adds Hilton-style luxury to this kid-friendly charm through oceanview suites with private balconies, luxurious bedding and more. Plus, this location is unbeatable – Myrtle Beach offers spectacular golf, tennis, shopping, dining and more. To make your getaway more affordable and convenient, ask about their packages! From Atlanta, follow I-20E to Florence, SC. Take I-95N to Exit 170. Follow Hwy 327 to its end and turn left onto Hwy 76/301. Take Hwy 501S to the exit for Hwy 22E. Take the Kings Road exit, turn right at the bottom of the exit ramp. Kingston Plantation will be on the left. Kingston Plantation offers complimentary shuttle service to some of the Myrtle Beach attractions, including Tanger Outlet Mall, Arcadian Shores Golf Course and more! Capping off our Top 10 list is the impressive Water Park of America, combining with the Radisson Hotel in Bloomington, MN, to create the largest waterpark hotel in the U.S. This waterpark is designed to highlight Minnesota’s unique attractions. Surfing in Minnesota? That’s right – this waterpark features Minnesota’s only FlowRider Surf Simulator. Take a swim in the Lake Superior wave pool, or sit back on a tube as the lazy river takes you underneath bears and along cliffs. But the biggest gem of the waterpark – literally – is the indoor family raft ride, the longest one in America! This ride is ten-stories-tall and over a mile long. The activity pools are great for a friendly game of water basketball. And for the smaller children, Fort Snelling play area gives them all the interactive water activities they could want. Plus, they’ll love the tipping bucket with 500 gallons of water that empties every two and a half minutes. Make sure to stop by the Northern Lights Arcade, featuring 5,800 sq. ft. and more than 100 games. Ask about the birthday party packages! The Mall of America is just minutes away from The Water Park of America! The FlowRider cycles through 24,000 gallons of water per minute; its sheet of water moves between 25 to 30 miles per hour! Experience central Ohio’s largest indoor waterpark – a mix of Old Western style and thrilling water adventure! Fort Rapids Indoor Waterpark Resort presents you with 60,000 square feet, filled with exhilarating rides, kids activities and more! Let the kids loose at the Kiddie Korral, featuring 2 small slides, an interactive play structure and a zero-depth entry pool. They’ll love the 1,000-gallon tipping bucket at the Rascal Round Up! Fort Rapids offers 12 unique waterslides, some of which extend outside the building, then wind back in! For an adrenaline rush, check out the Black Out Pass, a tube ride with lightning turns that shoots you into a giant funnel then empties out onto the lazy river. Have a friendly family mat race down the Shoot Out Racer. The 30-person hot tub is only for guests 18 years and older – a great place for quiet relaxation. After you’ve had your fill of waterpark adventure, visit the 5,000-sq.-ft. Gold Rush Arcade or the Cold River Mining area to find gemstones and fossils. Ask about Fort Rapids’ birthday party package! At the onsite Old Tyme Photography, you can dress up as Civil War soldiers or Southern Belles and take a family portrait! From the West – Take I-70 to Hamilton Road South. Cross over Hamilton Road at end of exit ramp (appearing to merge onto I-70E). Turn right on Truro Station Drive. Turn left on Hilton Corporate Drive. Fort Rapids will be on left. Whether it’s the bold animal prints or the waterslides that reach speeds nearing 40 mph, you’ll feel your adrenaline pick up speed as soon as you arrive at our No. 2 pick. The African-themed Kalahari Waterpark Resort in Sandusky, Ohio, is the largest indoor waterpark in the U.S.
For the thrill seekers – experience what a 40-mph waterslide feels like on the Zimbabwe Zipper, the fastest in the waterpark. Or work your way up to it by starting on the 20-mph Zip Coaster, a tube ride that features 500 ft. of gut-wrenching free falls, dips and high-banking turns. Learn to surf on the FlowRider, which simulates a 5-ft. ocean wave. And don’t worry if you’re not an adrenaline junkie – there’s plenty for you to do. Relax on a tube along the 920-ft. lazy river, complete with geysers, waterfalls and other fun surprises. And the 12,000-sq.-ft. wave pool is perfect for more subtle excitement. The kids will love the outdoor waterpark, featuring an interactive kids’ activity pool, spacious dry play area, sand volleyball, shuffle board and more! The resort also offers their spectacular Safari Outdoor Adventure Park, featuring a ropes course, sky trail explorer, zip line, adventure climbing walls and the Zanzibar Grille! From Cleveland, take I-90W to Exit 170B. Continue to follow I-90W, which will turn into Rt. 2. Follow Rt. 2 to the exit for Sandusky/Norwalk Rt. 250. Turn left onto Rt. 250. Kalahari will be on the left. Right next to the main lodge, the Upper Pools boast a collection of waterpark attractions and oodles of fun for the whole family! Drift around the lazy river and enjoy the gorgeous mountain scenery- at Mt. Princeton, you get the best of both worlds! The spacious park is filled with grassy area and plenty of lounge chairs for relaxation. But let's be honest- you're here for the slide. And that's completely understandable; it's 400’ of high-speed excitement! Grab mat and make the short climb to the top, then hop on your mat and ride the six giant turns emptying into the cooler 75-degree pool on the upper deck. Rinse and repeat! The resort is 9 miles from Buena Vista. There are tennis and basketball courts on-site, plus free parking. Discover a new wave of waterpark resort at Three Bears Lodge. Featuring an array of aquatic adventures and superb amenities, you'll have the time of your life. Attractions for every age ensure that kids and adults alike are in for an unforgettable Wisconsin waterpark vacation! Located in the Cranberry Capital of Warrens, Three Bears Lodge is a family fun center! A 50,000-square-foot indoor and outdoor water park entertains all ages with swimming pools, twisting slides, an aquatic playground, and more. Sample delicious eats at a handful of family friendly restaurants, get goofy in the many game rooms, and kick up your feet in your spacious room. Choose from a guestroom or suite, which feature amenities like wireless internet, balconies, family dining rooms, and outdoor fire pits! If you're looking for off-site adventures, start with some outdoor fun hiking through the Necedah National Wildlife Refuge, a 44,000-acre ode to wilderness. Next, head to Yogi Bear's Jellystone Park, where a host of family attractions await. Go horseback riding through the lush landscape of Black River State Forest or stay on your own two feet an explore the many trails. Adults can find interesting items at the Antique Mall of Tomah, Wisconsin. Experience unforgettable family fun at Three Bears Lodge! Discover the unique heritage of the Cranberry Capital at the Wisconsin Cranberry Discovery Center, which features cranberry exhibits and delectable treats! The year-round waterpark offers slides, fountains, and wave pools for the kids and a lazy river and spa for the adults! Yogi Bear’s Water Zone is a stupendous way for families to spend a hot summer afternoon! The pool is superbly interactive and multi-leveled, with kiddie slides, water spray features, and a hydro storm tower (which dumps water every few minutes) scattered about. Adults will appreciate the comfortable seating where they can relax and watch the kids play, while the Cartoon Cafe is the perfect place to grab an a rocky road ice cream cone. When you're not splashing away, you have Jellystone's wealth of other amenities available at your beck and call! Kids could spend all day jumping on the big, inflatable pillow onsite. Adults don’t usually last quite as long, but it’s good exercise for them, too! The onsite pedal carts are a great way for you and your kids to have fun and burn off excess energy. Rent a pedal cart for 30 minutes or 1 hour and enjoy some exercise. There are both two and four-seater carts available!